Editor’s Note: Administering a website like this occasionally makes editors privy to some exotic and intriguing correspondence. In light of the particularly dark nature of some letters we have stumbled upon—we can’t reveal exactly how—we thought it our duty to share this series of missives. We appear to be in possession of only one side of the exchange of letters—from a nephew to his uncle. The nephew’s name is Ichabod and his uncle’s name Apollyon, who seems to be in an advisory position of some sort. It’s not our intent to demonize anyone by divulging what we have seen, but we feel we are performing an important service by bringing this devilishly cunning correspondence to light. Here is the twenty-second letter we were given. I'm glad you recognize that I have had to clean up the mess left here by my immediate predecessors. I acknowledge that they operated among a less materially prosperous flock, and that they were thus deprived of some of the advantages I have had through the fairly well-heeled (and thus more spiritually flabby) group now at Broad Way. But there is no excuse for their letting so many of the older members of the congregation get into dangerous habits, like regular prayer and Bible reading and sharing their spiritual struggles with each other. Some of those people, even though they're not particularly prominent in the public operation of the church, are troublesome prayer-warriors; I think their vigilance is one of the reasons that Brother Whitesoul is so hard for us to get to. I've felt the power of their protective intercession more than once when I wanted to shoot a fiery dart of temptation or discouragement at him. Otherwise, things are going fairly well for us. The youth worker I spoke of has resigned from his work in order to prevent more scandal, and I think I detect some bitterness toward the Enemy for letting this happen to him. Happily for us, not many people have rallied around to help him through his difficulties, either because they think he's guilty and don't want to be contaminated, or because they don't think his problems affect them one way or another. I look on gleefully when Christians who are quite bold about spreading gossip develop acute timidity when it comes to dealing in any direct way with someone wounded—rightfully or wrongfully—by a bad development in his life. One good side-effect of this incident is that it reinforces people's natural tendency to rock along in the church comfortably detached from trouble, whether inside or outside the congregation. And, as I mentioned, the power of Mammon is gaining ground at Broad Way. It's wonderful how perversely the well-to-do can turn a legitimate concern with having enough themselves into a consuming insecurity and anger about not having as much as somebody else. The level of material possessions taken for granted here as necessary to happiness is gratifyingly high. Contentment is a concept rarely talked about, and a state of mind understood by hardly any except those whose material holdings are much less noticeable than their character. (Indeed, I must admit that the advantages of "contentment" entirely escape me; it's so suppressive of self and so sickeningly submissive to the tyrannical Creator.) I try to make sure that people are not distracted by heavenly intimations that there is such a thing as sufficiency in this world's goods; any serious consideration of that dangerous doctrine would most surely tempt our clients to simplify their lives (and deny their competitive potential!) by focusing on the Enemy. My political life is faring well. The fact that the moral standards of the citizenry are rather low means that they are willing to tolerate shady and dishonest acts by their elected officials that would have meant impeachment or at least defeat in the next election twenty or thirty years ago. I've already found that a hint of future favors allows a councilman to run up a rather large bill at some establishments, and that even church members are willing to turn a blind eye to the ethical and moral questionability of political actions that might bring advantages to "the Lord's Body." The church will not oppose a local lottery, for example, so long as it gets a piece of the action. I sometimes wonder how much hypocrisy I need to exercise as a politician, since many people seem to take it for granted that those in public office have to be a bit careless of conscience if they are going to get anything good done for their constituents. If that kind of "good" is what is in demand, no need to confuse the fools by tempting them to embrace "evil." Editor’s Note: Administering a website like this occasionally makes editors privy to some exotic and intriguing correspondence. In light of the particularly dark nature of some letters we have stumbled upon—we can’t reveal exactly how—we thought it our duty to share this series of missives. We appear to be in possession of only one side of the exchange of letters—from a nephew to his uncle. The nephew’s name is Ichabod and his uncle’s name Apollyon, who seems to be in an advisory position of some sort. It’s not our intent to demonize anyone by divulging what we have seen, but we feel we are performing an important service by bringing this devilishly cunning correspondence to light. Here is the twenty-third letter we were given. Your brooding encouragement always darkens any light which I may be tempted to let in. Thank you for pushing me on to greater depths of linguistic perversion. I shall try to make sure that the pitfalls of prattle and the sloughs of slander are continual traps for those in my congregation. I'm going to take a break from Broad Way in this letter and tell you about some work I've been doing in a neighboring congregation that has a new, rather high-powered, intellectual preacher. He's eager to put all of the newest techniques of church growth into effect, but he's viewed with some suspicion by a group of zealous young men who are rather self-consciously "drunk with the Spirit" and are on the lookout for "unsound" preaching. I just couldn't resist getting in and meddling with a situation where well-intentioned and committed people are at odds with each other, especially since that congregation has been given only part-time attention by our agent, Asphalt, who is occupied elsewhere right now. I've been talking with one of the young turks and encouraging him not to give an inch in demanding that the "pure gospel" be preached--which means, of course, only that part of the gospel which he has already understood and mastered and with which he feels comfortable. If I get a chance to talk to the preacher, I will urge him to be self-righteous and unyielding on his side, as well; that ought to set up a very satisfying confrontation between them where both are standing on principle and neither can afford to retreat. Naturally, I don't give a hoot about which of them is correct, so long as both sides are convinced that holding to their perception of truth is more important than working things out between them. Nevertheless, it appears to me that the preacher, for his part, is correct in concluding that the congregation as a whole has no desire to be any different from what they are--that is, 95% comfortable, middle-class, and white-Anglo-Saxon. Since most of the truly needy people in our society (the ones most desperate to hear some "good news") don't fall into those classifications, the prospect of reaching out to "bring in the sheaves" is decidedly less attractive to the congregation than tending to their own walled garden. Now the young spiritual inebriates don't fall exactly into that class, but I think with a little coaching they can be made as walled-in and protective as the others. In their case, it would be protecting spiritual "good feeling," rather than material and social comfort, and in the process failing to understand that the avenue by which they came to that "good feeling" may not be open to people who have no religious background at all. The preacher should be prodded to view them as narrow unsophisticates who create spiritual elitism out of ignorance and immaturity. The young turks, upon seeing this attitude, could then easily be persuaded to dismiss him as an over-educated snob who thinks more of social theory than he does the Bible. The really scary possibility is that the preacher, with his desire to cross cultural boundaries and develop a different idiom of communication to reach the unchurched, and the "Spirit-filled" bunch, with their zeal and recklessness, might sit down together in a mutual desire to serve God and discover the power of combining their respective strengths. That must be prevented at all costs! I'll get back to Broad Way in my next letter. It ought not to take long to break this little congregation wide open. Image: The Pulpit by B0US1 CC license. Editor’s Note: Administering a website like this occasionally makes editors privy to some exotic and intriguing correspondence. In light of the particularly dark nature of some letters we have stumbled upon—we can’t reveal exactly how—we thought it our duty to share this series of missives. We appear to be in possession of only one side of the exchange of letters—from a nephew to his uncle. The nephew’s name is Ichabod and his uncle’s name Apollyon, who seems to be in an advisory position of some sort. It’s not our intent to demonize anyone by divulging what we have seen, but we feel we are performing an important service by bringing this devilishly cunning correspondence to light. 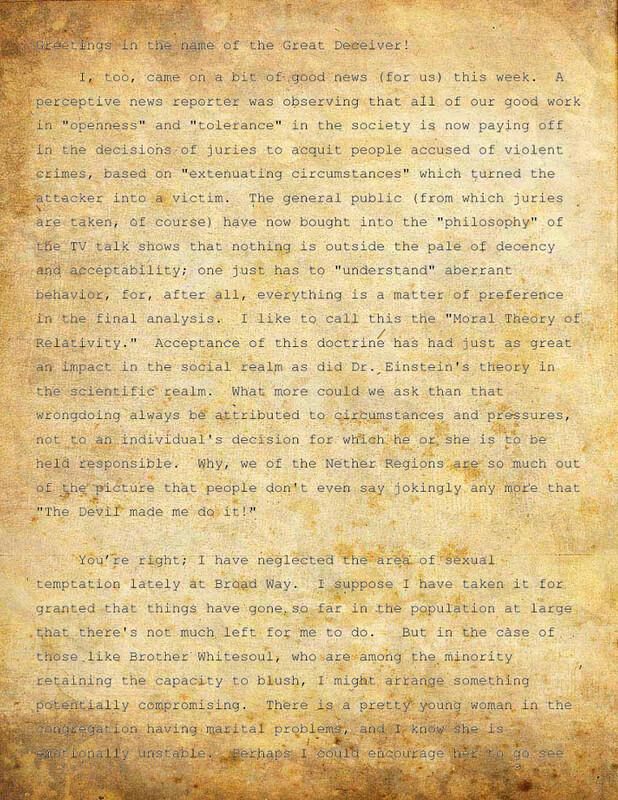 Here is the twenty-fourth letter we were given. I'm glad you approve of my efforts in linguistic perversity, and I welcome the examples of your own contributions to that realm of endeavor. In regard to the little congregation I spoke about in my last letter (pitting the young zealots against the new preacher), I'm afraid the entirely bad results I was hoping for have been modified: the "Prayer Warriors" have been at it again. Neither the preacher nor the zealots were listening much to me when I left, because they had all begun to develop two qualities that make it very difficult for "us" to get through to them: humility and remorse. One of them mentioned to me that he had read in his devotional some biblical claptrap about "counting others better than yourself." The whole thing was threatening to degenerate into a huggy-wuggy reconciliation, but Asphalt will have to worry about that. (I just hope he gives me credit for sowing seeds of dissention while he was gone.) I had to get back to Broad Way to encourage some twisted thinking that has developed there. It seems that once again we have a delightful clash of good intentions in the congregation. This time it has to do with how much of the mess humans often make of their lives is to be dealt with as "sickness," over which they have little or no control, and how much as willful acts of sin, for which they are to be held fully responsible and even punished. Once again, I see the opportunity to drive people into mutually exclusive camps. The "sickness" group, who pride themselves on compassion, will easily be persuaded to set aside any imperative to deal with sin when it "comes with the territory," so to speak; and the "sin" bunch will settle in comfortably behind the impregnable defense of their theology, looking only at the activities that are problems for others but not for themselves. Addicted smokers and eaters can thus point to factors that make it impossible for them to change their behavior; those engaged in sexual misconduct will say that they are merely "doing what comes naturally"; and all sorts of crimes will be justified by social conditions which dull or eliminate individual initiative and responsibility. There is enough truth in these excuses (given the corruption of creation brought about by our Infernal Father) for one to insist that, in all fairness, people ought to be let off the hook for their peccadillos. But, on the other hand, the judgment-hounds have plenty of scripture to back up their contention that every person must answer for his or her own deeds, whatever the circumstances. I hope the debate gets so hot that nobody remembers such mysteries as the love, grace, and sovereignty of God; for to introduce these qualities of the Divinity would undermine a mistaken assumption which is absolutely necessary to our program of deceit: that purely human standards and understandings of fairness constitute the final court of appeal for interpreting evil in the world. If I were as weak, messed up, and vulnerable as humans are, I would be concentrating on seizing whatever deliverance from my condition the Great Thunderer is offering, rather than quibbling over whether I should be regarded as needing it or not. But, fortunately for us, they seem mostly determined to ignore how bad off they are, so intent are they on preserving what they quaintly call their "self-respect." Did you notice all the shallow and foolish rhetoric flying about in the media during the election? Everything and everybody must "move forward" --which always means a particular candidate's or party's agenda for perfecting the world, of course. How salutary for our cause that politicians hardly ever get into office by merely using common sense to define their objectives; that has no imagination to it, and it usually requires people to give up some of those things which they consider to be their rights or legitimate comforts. How prosaic merely to match up income and expenditures, when there are so many pork barrels clamoring to be filled. And isn't an entertaining sound-bite to be preferred over boring discussions about what we have to give up to preserve the integrity of both our social and our natural environment? Ah, yes, election years are the Devil's workshop. Image: "Where everything begins" by yomo 13. CC license. Editor’s Note: Administering a website like this occasionally makes editors privy to some exotic and intriguing correspondence. In light of the particularly dark nature of some letters we have stumbled upon—we can’t reveal exactly how—we thought it our duty to share this series of missives. We appear to be in possession of only one side of the exchange of letters—from a nephew to his uncle. The nephew’s name is Ichabod and his uncle’s name Apollyon, who seems to be in an advisory position of some sort. It’s not our intent to demonize anyone by divulging what we have seen, but we feel we are performing an important service by bringing this devilishly cunning correspondence to light. Here is the twenty-fifth letter we were given. Your encouragements for fostering proud humility are noted, and my efforts in that direction are, if I may say so with modesty, bearing fruit. Ancestry in the church is a good field in which to cultivate such feelings. Just the other day I overheard Sister Campstone noting with satisfaction that her forebears had been simple New Testament Christians since the middle of the nineteenth century. She is convinced, of course, that they held to the same narrow version of "the Gospel" as she does, and that her pedigree gives her special authority in defining who the "true" Christians are. She finds it ridiculously easy to embrace at the same time the hardy, rugged values of her ancestors and her own lavishly comfortable way of life. Being rich and successful makes it easier to glorify and romanticize poverty and hardship. There are not many Jobs in this world, whose character must be tested severely before their full strength becomes apparent; with most, a little plush living will reveal their inner "net worth" quite well. To revise a domestic proverb, "The way to a man's (or woman's) heart is through his pocketbook." You ask about some of the other members at Broad Way on whom I have reported previously. "Scooter" Barton has scooted right out of our congregation to greener pastures, I'm sorry to say. He was indeed an asset to our objectives, but his talents have now been turned to a touchy-feely scam in the community from which he stands to make a handsome profit, based on his capacity for charming hypocrisy. He claims to have "outgrown" his previous religious conservatism, now that he understands the universality of the divine nature. No longer hampered by even the appearance of having to worry about sin and redemption, he has now espoused his own profitable brand of New Age philosophy and is peddling it (at a proper price, of course) to the unsuspecting insecure-but-well-heeled citizens of our community. I understand he has quite a following at his new "Church with Many Doors." No doubt he has already figured out which door he will leave from when the poor suckers finally see through him. Brother Silvertone is still engaging in sonorous addresses to the Almighty. He has not yet had a response from the Almighty, so far as I know, but the members of the congregation are all mighty impressed by his oratory, and that is of course what he's really after. I make it a point to keep the compliments coming every time he prays in public. You must admit that he has found an effective defense against God: it's much easier to keep Him at a distance when you talk to Him only in public, and at the same time few people are going to be presumptuous enough to express doubts about the spiritual health of someone who prays so beautifully. Brother C. Sharp is having trouble with a group of "Rip-Roarers" who insist on interjecting spontaneous praise choruses into our Sunday night services. Some of them even raise their hands or clap during such songs! Now C. Sharp has never been known to raise his voice spontaneously or to clap except at sporting events, where excitement and enthusiasm are expected and proper. He has therefore identified himself firmly with the "Stick-in-the Muds" in condemning unseemly emotional displays in church. Luckily for us, no one has had the boldness to point out to him that some might find his boisterous laughter in the middle of the music group's rehearsal of a meditative song just as offensive and inappropriate as he finds the peppy songs--and with better reason, at that. As to Brother Whitesoul, since it appears that we're not going to lead him astray in any significant way, I've been making quiet remarks that perhaps our congregation should be considering a more stylish and charismatic minister. (Not "charismatic" in any dangerous sense, of course, but just a charmer--maybe a bit like "Scooter" Barton!) Sister Snugrug has picked up on this line (she's on everybody's line) and is spreading the word, with her own distinctive embellishments. We'll see what comes of this tactic. Well, as they say, "Sufficient to the day is the evil thereof." I hope to have even more hellish things to report next time. Image: "typewriter" by nicoleleec. CC license. Editor’s Note: Administering a website like this occasionally makes editors privy to some exotic and intriguing correspondence. In light of the particularly dark nature of some letters we have stumbled upon—we can’t reveal exactly how—we thought it our duty to share this series of missives. We appear to be in possession of only one side of the exchange of letters—from a nephew to his uncle. The nephew’s name is Ichabod and his uncle’s name Apollyon, who seems to be in an advisory position of some sort. It’s not our intent to demonize anyone by divulging what we have seen, but we feel we are performing an important service by bringing this devilishly cunning correspondence to light. Here is the twenty-sixth letter we were given. All of your talk of sowing and reaping makes me somewhat uncomfortable. We may take some satisfaction in seeing these humans ignore the coming consequences of their actions, but with the Tyrannical Creator lurking out there, just waiting to end our game and toss us into the Outer Darkness, I can't say I look forward to seeing the score settled and the chips cashed in. Humans, after all, can indulge in the foolish but comforting luxury of not believing in God. We devils, unfortunately, don't have the capacity to hide under the blanket of physical existence and pretend we're nothing but a concatenation of atoms. We're all too terribly and constantly aware of the spiritual realm and the high eternal stakes we're playing for. I don't know why the Old Softie continues to let us do all the damage we do, but I'm going to enjoy it while I can. I must try to relish the fact that for us, doing evil is its own reward. I am continually amazed (but of course gratified) at the mental gymnastics by which humans manage to bypass not only all the evidences of the Creator's presence in the world, but their own moral and spiritual nature as well. It takes a very "sophisticated" intelligence indeed to cast aside the very ground of one's being. We of the Ultimate Rebellion know That with which we contend: we hate It and strive against It (but not without trembling), even though we know Its power. These sons and daughters of Adam and Eve, on the other hand, choose to lock out of their cognizance the Source of their lives, while they nose around like animals in a trash dump to find scraps of superficial, man-made "spirituality" to satisfy their deepest longings. Fortunately, we don't have to fully understand these creatures in order to damn them; and I'm not one to look a gift soul in the cranium. I'm happy to say that there's trouble brewing in the home congregation again. Sister Outreach and Brother Inscape have locked horns over a proposed new Sunday School curriculum for the adults. Brother Lockstep, the Sunday School Director, has introduced a plan to have all adult classes go through an outline of the Bible in a year. Now this sounds like a sterling suggestion, but Sister Outreach contends that people know enough about the Bible already and should be learning about the missionaries we support; and Brother Inscape insists that what is really needed is an hour of meditation each Sunday morning, or at least some really juicy sharing of our emotional problems. Brother Lockstep has responded with a predictable "pox on both your houses," since both of their preferences are entirely too unstructured for him. I am trying to cultivate the clash between them, since if they sat down and discussed the matter in a prayerful spirit, they might find out that each of them has something valuable to contribute to a solution, and that looking both inward and outward in a disciplined way might be upbuilding to the church. My strategy is to convice each of them to continue fighting for principle’s sake and not to engage in weak-kneed compromise. By the way, something ought to be done about the legacy of this Chuck Colson fellow. In one of his books, The Body, he presents some dangerous threats to our work by attacking the popular idea that a church is to be mainly a haven from stress on Sunday for people who work hard making money and buying things all week. If people actually start believing that the real Church is not defined by good-looking buildings and social respectability, we could be in real trouble. He seems to think that persecuted (or at least "unrespectable") Christians may very likely make a greater impact on the world than those who fit well into the society. Fortunately for us, that point of view is probably not going to be much heeded; in fact, we may even garner some opposition to it from the pulpit. image: "Dormitory Mailboxes" by J. Lillis. CC License. Editor’s Note: Administering a website like this occasionally makes editors privy to some exotic and intriguing correspondence. In light of the particularly dark nature of some letters we have stumbled upon—we can’t reveal exactly how—we thought it our duty to share this series of missives. We appear to be in possession of only one side of the exchange of letters—from a nephew to his uncle. The nephew’s name is Ichabod and his uncle’s name Apollyon, who seems to be in an advisory position of some sort. It’s not our intent to demonize anyone by divulging what we have seen, but we feel we are performing an important service by bringing this devilishly cunning correspondence to light. Here is the twenty-eighth letter we were given. Many thanks for your encouragement of my efforts and your optimism about my winning recognition in the NAASSTY (I think you left out the last words in the title--"and Tempters of Youth"). I hope before long to advance to the Council of the Ungodly. No doubt you were admitted long ago to the Way of Sinners and the Seat of Scoffers fraternities. Is it true, as I have heard, that to be admitted to the Seat of Scoffers Society you have to give a thirty-minute impromptu refutation of some point of the Apostles' Creed? And that furthermore it has to be scathing enough to reduce all but the strongest believers to abject intellectual shame? That must be something to hear! I would love to listen to your initiation piece sometime. I may need the asbestos suit just for that. I have no new initiatives or developments to tell about at Broad Way Church. Actually, things seem to have been rocking along pretty well without any special effort on my part. I heard a heartening statistic recently, to the effect that the average American gives only about 3% to charitable causes, and that moreover even the average church-goer doesn't rise above that level. I'll bet most of the church people pay more of their income in interest on their credit card and automobile debts than they give to support the Enemy's work. Hasn't the easy availability of credit been wonderful for our cause? It works right in with our strategy of making discipline and deferred satisfaction look ridiculous. As to your worry about reclaimed ministerial drop-outs, I think we have first of all to cultivate people's natural tendency to gloat over those who have "fallen" (never allowing the gloaters to realize that the only reason they've not fallen is that they've never been anywhere to fall from). Even the sincere restorers of the fallen will probably not heed the warning of their Book to look to themselves, lest they too be tempted, and we can get at them in the vulnerability of their over-confidence. One pitfall for these Believers that we don't have to deal with is getting careless and slacking off; our persistance has won many a victory that would have gone to the Enemy, if only His children had realized (as we do) that there is no truce in the battle we wage. So even if the do-gooders in the "Safety Net" program achieve some turn-arounds, they probably won't get enough prayer support and financial help from the rest of the Body to carry on long-term; then they'll get discouraged themselves and wind up in the same boat as those they're trying to rescue. May it be so! Image: "mailbox" by Johnny Hughes. CC License. Editor’s Note: Administering a website like this occasionally makes editors privy to some exotic and intriguing correspondence. 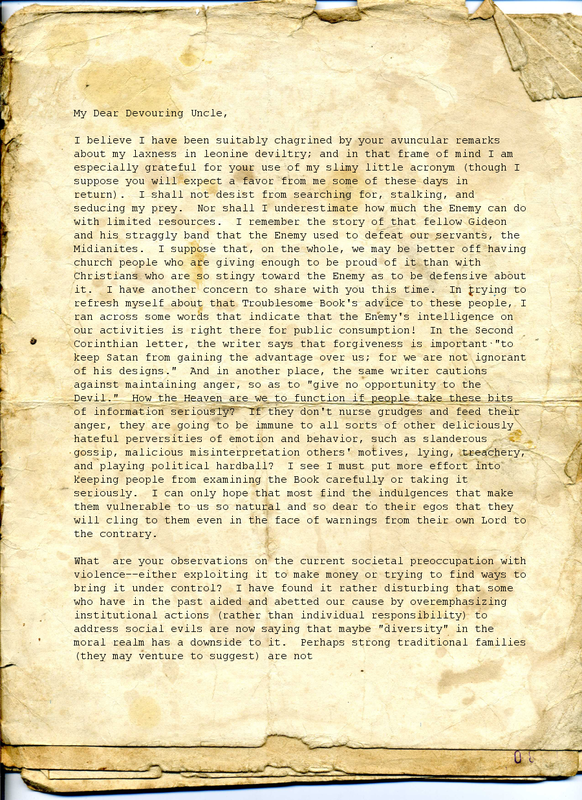 In light of the particularly dark nature of some letters we have stumbled upon—we can’t reveal exactly how—we thought it our duty to share this series of missives. We appear to be in possession of only one side of the exchange of letters—from a nephew to his uncle. The nephew’s name is Ichabod and his uncle’s name Apollyon, who seems to be in an advisory position of some sort. It’s not our intent to demonize anyone by divulging what we have seen, but we feel we are performing an important service by bringing this devilishly cunning correspondence to light. Here is the twenty-ninth letter we were given. I believe I have been suitably chagrined by your avuncular remarks about my laxness in leonine deviltry; and in that frame of mind I am especially grateful for your use of my slimy little acronym (though I suppose you will expect a favor from me some of these days in return). I shall not desist from searching for, stalking, and seducing my prey. Nor shall I underestimate how much the Enemy can do with limited resources. I remember the story of that fellow Gideon and his straggly band that the Enemy used to defeat our servants, the Midianites. I suppose that, on the whole, we may be better off having church people who are giving enough to be proud of it than with Christians who are so stingy toward the Enemy as to be defensive about it. I have another concern to share with you this time. In trying to refresh myself about that Troublesome Book's advice to these people, I ran across some words that indicate that the Enemy's intelligence on our activities is right there for public consumption! In the Second Corinthian letter, the writer says that forgiveness is important "to keep Satan from gaining the advantage over us; for we are not ignorant of his designs." And in another place, the same writer cautions against maintaining anger, so as to "give no opportunity to the Devil." How the Heaven are we to function if people take these bits of information seriously? If they don't nurse grudges and feed their anger, they are going to be immune to all sorts of other deliciously hateful perversities of emotion and behavior, such as slanderous gossip, malicious misinterpretation others' motives, lying, treachery, and playing political hardball? I see I must put more effort into keeping people from examining the Book carefully or taking it seriously. I can only hope that most find the indulgences that make them vulnerable to us so natural and so dear to their egos that they will cling to them even in the face of warnings from their own Lord to the contrary. What are your observations on the current societal preoccupation with violence––either exploiting it to make money or trying to find ways to bring it under control? I have found it rather disturbing that some who have in the past aided and abetted our cause by overemphasizing institutional actions (rather than individual responsibility) to address social evils are now saying that maybe "diversity" in the moral realm has a downside to it. Perhaps strong traditional families (they may venture to suggest) are not so dispensable as the "enlightened" have been telling us they are. This is dangerous talk! Having gained so much ground in the undermining of family structures, we cannot at this advanced point let mere common sense take over again. I take every opportunity to reinforce the principles of relativity and uncertainty when people begin to talk about finding some common ground for moral instruction in the schools. I trust that the assumptions of humanistic optimism will limit such searching to futile attempts to identify a remedy for sin that doesn't acknowledge that sin exists. What a truly hellish paradox that is! I must go now, for I have been invited to attend the board meeting of some pesky little religious journal that operates on a shoestring and has only a small circulation, but that might do us the kind of damage that the Enemy's "little things" sometimes do, if the people involved are not sidetracked somehow. Image: "Mailboxes" by A. Lyubavin. CC license. Editor’s Note: Administering a website like this occasionally makes editors privy to some exotic and intriguing correspondence. In light of the particularly dark nature of some letters we have stumbled upon—we can’t reveal exactly how—we thought it our duty to share this series of missives. We appear to be in possession of only one side of the exchange of letters—from a nephew to his uncle. The nephew’s name is Ichabod and his uncle’s name Apollyon, who seems to be in an advisory position of some sort. It’s not our intent to demonize anyone by divulging what we have seen, but we feel we are performing an important service by bringing this devilishly cunning correspondence to light. Here is the thirtieth letter we were given. Greetings in the name of the Great Deceiver! I, too, came on a bit of good news (for us) this week. A perceptive news reporter was observing that all of our good work in "openness" and "tolerance" in the society is now paying off in the decisions of juries to acquit people accused of violent crimes, based on "extenuating circumstances" which turned the attacker into a victim. The general public (from which juries are taken, of course) have now bought into the "philosophy" of the TV talk shows that nothing is outside the pale of decency and acceptability; one just has to "understand" aberrant behavior, for, after all, everything is a matter of preference in the final analysis. I like to call this the "Moral Theory of Relativity." Acceptance of this doctrine has had just as great an impact in the social realm as did Dr. Einstein's theory in the scientific realm. What more could we ask than that wrongdoing always be attributed to circumstances and pressures, not to an individual's decision for which he or she is to be held responsible. Why, we of the Nether Regions are so much out of the picture that people don't even say jokingly any more that "The Devil made me do it!" sexual pleasure is the chief good in life, to which everyone has an absolute right, and (2) the Enemy wants more than anything else to deprive his children of sexual pleasure and fulfillment. Ah, the neuroses and profligate flings that have been produced from the interplay of these mistaken and complementory assumptions! Well, as our Spanish–speaking agents might say, "Another day, another *dolor." Or, to turn one of the Enemy's sayings to our own use, "Sufficient to the day is the evil thereof." I'm going to sit in front of the TV and see what the edgy TV hosts are doing for us these days. Did they get that sleazy all by themselves, or did we have a special agent working on them? *"Dolor" in Spanish means "pain." Image: "Mailboxes" by tanakawho. CC license. Editor’s Note: Administering a website like this occasionally makes editors privy to some exotic and intriguing correspondence. In light of the particularly dark nature of some letters we have stumbled upon—we can’t reveal exactly how—we thought it our duty to share this series of missives. We appear to be in possession of only one side of the exchange of letters—from a nephew to his uncle. The nephew’s name is Ichabod and his uncle’s name Apollyon, who seems to be in an advisory position of some sort. It’s not our intent to demonize anyone by divulging what we have seen, but we feel we are performing an important service by bringing this devilishly cunning correspondence to light. Here is the final letter we were given. You must have noticed that it’s been some time since I last wrote. That’s because I have had some strange experiences that I will try to explain to you, though I have little hope you will understand (indeed, I’m not sure I understand myself). These events have shattered my assumptions about the nature of the battle between our Infernal Father and the Eternal Ruler he has taught us to hate. 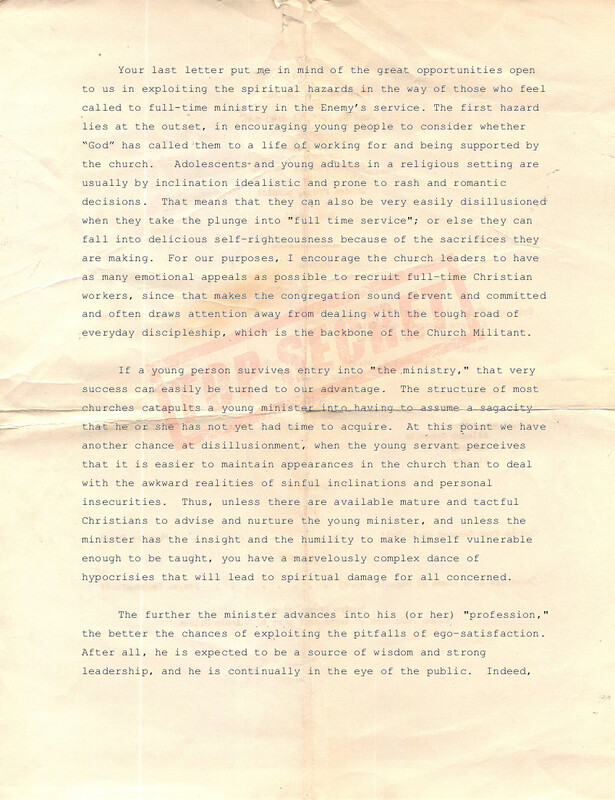 It began with my trying out a new strategy with Brother Whitesoul, who has been the chief obstacle to my campaign to neutralize Broad Way Church as an effective base of operations for the propagation of the “Good News.” Although I have been able repeatedly to bring discouragement on this preacher, the Power he serves has always stepped in and thwarted my designs. So I thought I’d take a more direct approach, worming my way into his confidence by offering to “pray” with him regularly. However, after I had met with him a few times, I realized that, though he has had enough trials in his life to make him cynical and even bitter, he has a simple trust in his Lord that makes him both joyful on his own behalf and truly loving toward others. I was taken aback when inquired into my background, and he seemed so genuinely interested in me that I found myself telling him more than was good for maintaining my cover. Even with only partial information about my history (a bad social environment, hanging out with sordid characters), he had enough insight into my feelings to detect my uneasiness with what seemed to me his naiveté about the tactical advantages of evil over good. Here I was trying to undermine his soul, and his love and sympathy toward me put me into confusion. I had to reassess the values that had always driven me. I realized after some agonizing analysis of my motivations for service to our Lord Satan that I have been driven by a combination of relishing what seemed his spirit of noble rebellion against arbitrary Sovereign Power, and wanting to please my peers (especially you, my mentor). Both of those motivations now seem trivial to me in light of the unqualified, magnificent love of the Creator as seen in the life of Brother Whitesoul. Also underlying my service to the Master of Rebellion was a desire to escape from the consciousness of being under the condemnation of the Righteous Judge of all; I feared punishment and wanted to ignore its inevitability by pretending that our fight against it was a noble project. I can anticipate what you are going to say in response to this letter: You will appeal first to my sense of loyalty to the Infernal Cause, and warn me not to throw away all of the training and education that you and others have bestowed upon me. Then you will threaten me with very present torments for my heresy, and you will remind me that no one leaves the ranks of Fallen Angels without paying heavily for it. But you can rave on, wily uncle, and promise me deliverance from crude immediate consequences, merely to distract my attention from the inevitable eternal calling to account that awaits all those of our party. I now realize that this judgment of God (yes, I now dare to use His Name, even out of the depths of my personal pit) is merely the objectification and final result of what we have done to ourselves by turning away from Him. I recognize now that underneath the façade of hearty collaboration among devils is our loathing and contempt for each other, and that means that we have no capacity to do anything at all except to turn pleasure into pain, for ourselves as well as others. Having deadened ourselves to any real satisfactions (because we are at war with the only Source of satisfaction), we are compelled to justify our emptiness by perverting pleasure in others. How far does God’s mercy extend? I don’t know; the path I now walk is uncharted territory, so far as I can tell. Has a demon ever repented? If so, it is not recorded. Nevertheless I have heard that true repentance is never without result. If it is only human beings who can experience salvation, then I shall gladly relinquish my created special nature and experience all the vicissitudes to which humanity has been subjected because of what we led them to. I shall even embrace the grave as a bride if it brings me into contact with the One who brought Love to the earth and conquered death. The most wretched state a human could endure would be a welcome penance to prepare me for the glory of deliverance from the body of the first Adam, a liberation that even angels cannot look forward to. Yes, Uncle, though all the fires of Hell consume me, I will utter the Name Above All Names—Jesus! Image: "Redemption?" G. Macorig. CC License.